The definitive blend of classic with contemporary femininity, the flowing design of these culottes make them as comfortable as they are chic. A midi dress that can be worn for all occasions, this piece features a delicate and super wearable design. Decorated with a charming blue star pattern, this dress is the ideal addition to this season’s fresh new wardrobe. If your aim is to inspire as many passers-by as possible, the Margot Dress is the one for you! 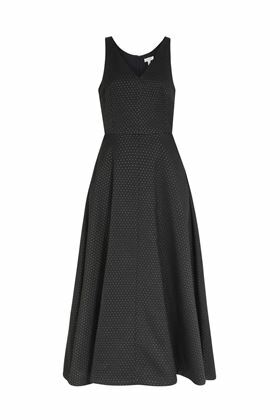 This statement midi-length dress has a flattering full skirt, semi-fitted bodice and open V-shaped neckline.